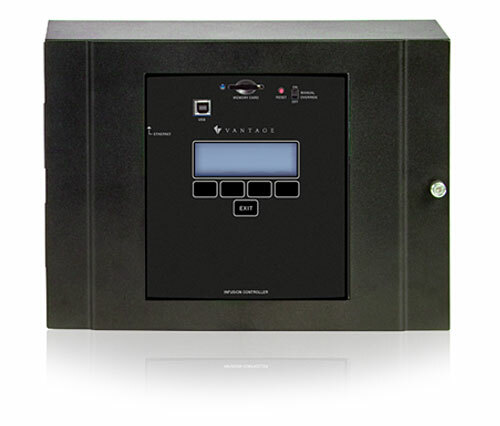 Designed primarily for Vantage's ScenePoint and RadioLink applications, the InFusion surface or rack mounted enclosures are ideal solutions for new construction or retrofit distributed dimming systems. Available in 24 and 36-volt versions, the Infusion Controller can be quickly and securely installed into the enclosure using thumbscrews. The Enclosure also features aright-angle power cord to more efficiently hold the power cord in place and avoid accidental power outages. Optionally, the power cord can be hardwired into the enclosure if needed. The InFusion SM/RM Enclosure utilizes an access panel in the bottom of the case for easy connection to a RadioLink Enabler and an Ethernet cable. This bottom facing access point can be easily rotated to face the rear of the Enclosure for efficient rack mounting.